Once in a while I like to get my fix of adventure fiction. As a teen I had read The Destroyer and The Avenger and Doc Savage and books of that nature, which were borderline pulps (or not-so-borderline in some cases). Finding books of that milieu today has been a bit more difficult for me – in part because I’m not sure where to look for them. When I came across this book and read the description it sounded exactly like what I’ve been looking for. James Schweitzer was a Navy SEAL when The Gemini Cell took everything from him … including his life. Now, as a dead man, Schweitzer is the best chance for defense. As a dead man, brought to an un-dead state by scientists, Schweitzer is now a super soldier. He can’t be easily killed, because he’s already dead, and he has been gifted with heightened abilities. Now he can infiltrate the enemy compound and fight the enemy super-soldiers – creatures just like himself … undead. But he’s still just one man against an army of like-ability soldiers and even his fellow SEALS don’t stand a chance against what amounts to a squad of vampires. One man might hold the key and he’s in a remote area of the Alaskan wilderness – and there’s an enemy base not too far away. The book definitely has that military/adventure feel to it – precisely what I was looking for – and it has a strong fantasy bent with the vampire/un-dead soldiers as major characters. It may be strange to say this, but it reads more like a military novel than a fantasy novel, which is probably not surprising, given Cole’s background. Horrible first chapter … looks like it will be action but instead it’s all talk and posturing and then enemies become partners too easily. I’d like to say that this was only true in the opening chapter as Cole sets up the story, but that wouldn’t be true. Too often, before an action sequence, we have to talk it to death. While it makes sense that in life you might want to talk about a plan to iron out the details, in fiction, especially military/fantasy/action fiction, we really just want to get to the action. Fortunately, when there is action it is exciting and well-written. I just wish there was less back-patting and more doing. Looking for a good book? 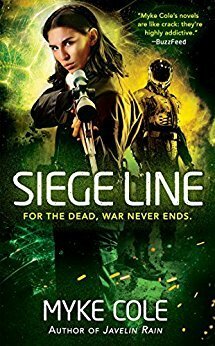 If you like a fantasy/military mash-up then Siege Line by Myke Cole might be just right for you.